Hermes brand new in box mini evelyne in etoupe taurillon clemence leather, contrast black strap and palladium hardware. Date stamp C for 2018. Comes with original dust cover, box and ribbon. Hermes brand new in box mini evelyne in black epsom leather and palladium hardware. Date stamp A for 2017. Comes with original dust cover, box and ribbon. 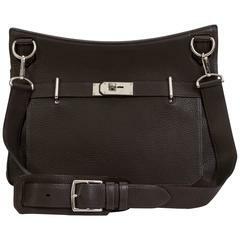 Hermès medium Jypsiere shoulder/cross body bag. Brown Togo leather and palladium hardware. Size 34cm. Partial plastic still on. Date stamp M for 2008. Comes with original duster.